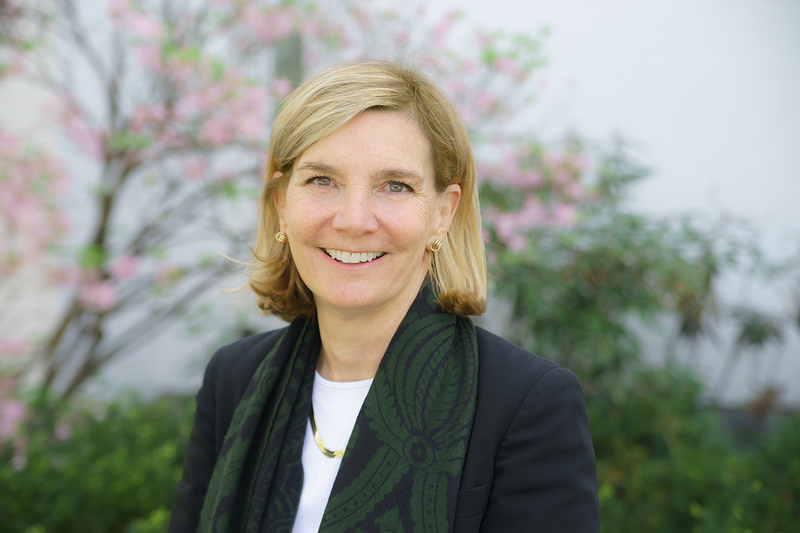 After more than six years of leading Dartmouth’s Office of Alumni Relations and helping to grow alumni engagement to record levels, Vice President Martha Beattie ’76 has decided to retire. President Phil Hanlon ’77 applauds Beattie for her role in enhancing the connections between alumni and the College. As a member of the first four-year class to matriculate women, Beattie helped pave the way for future generations of women of Dartmouth. Since then, she has committed herself to this institution and to creating meaningful pathways back to the College for all alumni. "Most people never have the chance to be a pioneer,” Beattie says of her role in that class. “Not only were we women in that first class of 1976 given the chance to do something for the very first time, to be that pioneer, but we were given the gift of being able to do it at Dartmouth." Beattie joined the College as vice president of alumni relations in May 2011 after a 30-year career as a math teacher, a rowing coach, and a volunteer leader and board member for schools and nonprofit organizations. Her tenure included the creation of the Dartmouth for Life program, a signature initiative designed to build lifelong connections through intellectual and career engagement opportunities. Beattie developed the Admissions Ambassador Program, which brought the alumni interviewing process and all its related activities under the alumni relations umbrella. In collaboration with athletics, she relocated the Wearers of the Green celebration to Hanover, recognizing the accomplishments of athletes each year at Homecoming. Dartmouth Reunions consistently set attendance and giving records under Beattie’s leadership, thanks in large part to her vision for how to engage and celebrate alumni hitting significant milestones in their lives. After the “Greenways” celebration of 40 years of coeducation, the Women of Dartmouth regional communities were born with Beattie’s guidance, and they continue to create strong bonds throughout the alumnae population. She also has worked to better inform the alumni body of campus developments—a goal that led her to form the Alumni Liaison Committee and to enhance communication between alumni councilors and their constituencies. Beattie served this institution long before joining the College as a staff member. She was an active volunteer in the alumni admissions interviewing program, class fundraising, and her own reunion committee. In 2001, she joined the Alumni Council and was later elected as its president. In 2006, she received a Dartmouth College Citation as co-chair of a fundraising effort that achieved the highest percentage of donors for a 30th reunion. She served as the alumni representative on the Presidential Search Committee in 2008. And in 2010, she was chosen for the Dartmouth College Alumni Award, the College's highest honor for alumni service. Even as vice president, she continued to volunteer, most recently serving as co-chair of the Class of 1976’s 40th Reunion and as a coach with the Dartmouth women’s crew. Beattie is the daughter of a Dartmouth alumnus from the Class of 1945. She met her husband, Jim Beattie ’76, during their college years and together they are parents of Sam ’07, Nell ’09 Tuck ’15, and Sarah. Josie Sandler ’91 of Sandler Search firm will lead a national search for a new Vice President for Alumni Relations. Please forward any inquiries, nominations, or referrals for this position to: Dartmouth@sandlersearch.org.